The Office of Child Support Enforcement (OCSE) says that Child Support is “good” for children and their most successful program to date. And one of the writers on the ABA blog writes that child support “IV-D only exists because of deadbeats…” But they don’t take a look at the destructive practices that this accomplishment drives. What Behaviors Does Title IV-D Drive in the States? The OCSE claims that the child support program solves just about everything. They say that it lifts children out of poverty, keeps others out of poverty, supports their social programs, encourages mothers to work more, and discourages mothers from cohabitating with new men. 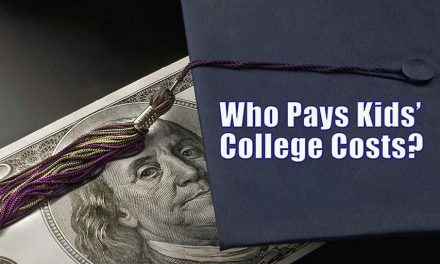 They say that the child support program is “so that children can count on their parents for the financial and emotional support they need to be healthy and successful.” They brag that this program is their most lucrative. However, what they don’t talk about is that the program drives certain behaviors in th e states in order to receive the incentive funding from this program. One of these behaviors is labeling parents and calling them names, like deadbeats. Carol Rhoades, a former Friend of the Court employee in Michigan confirms bad practices. She states that “no one wanted to improve services or hear about abuses within the system because every worker in these huge bureaucracies was trying to keep his/her job by covering up any errors or problems.” She says that her director would frequently say that they were not a Friend of the Family but a Friend of the Court and that they were the favorite of the court because they make the court money, unlike the bailiff’s and sheriff’s departments. The OCSE’s most recent FY 2016 publication confirms Carol’s statements claiming that the child support program is one of the most successful and profitable program. Is the Child Support Program Good for the Children? Health and Human Services looks at how many fathers it drives into poverty and counters that negative effect by saying, but our program has lifted more children out of poverty, so since millions of children have been lifted out of poverty and only 245,000 fathers driven into poverty, it is a net positive. Poverty isn’t the only metric that is measured. They acknowledge that there are other metrics that are important like how many mothers have been able to work more and therefore have health insurance available to them. However, it appears that their metrics are very gender biased. They focus quite a bit on the needs of the mother which can cause these statistics to not be truly representative of the needs of the children. 16 million children are directly affected by this program. Over 38 million individual parents are affected by this program. What are the Child Support Effects on Equal Parenting? Health and Human Services and their Office of Child Support Enforcement department are very aware that their incentive programs drive the behavior of the states regarding custody of children. That would be the point of an incentive program. This is like having a bonus incentive in your company to sell more product to bring up the company’s bottom line. In this case, the federal government is incentivizing the states to issue child support orders so that the welfare programs are not costing them. But that wasn’t enough incentive for the states. What did the states care if money came out of the federal government to support their poor? So the Social Security Title IV-D program had to create enough incentive where the state’s could be profitable. But did this also result in driving corrupt practices. And what are the states willing to cost the children and the parents? What is the cost to the children? 245,000 noncustodial parents were driven into poverty by child support. (OCSE 2015) Equal parenting increases children’s educational performance and therefore improving the economic independence of the future generations. Child support increases work and the quality of work among single mothers. 245,000 noncustodial parents were driven into poverty by child support. (OCSE 2015) If this is about the children, then we need to be focused on the development of the future generation and not create dependent children on the system. Child support reduces public assistance use New TANF enrollments increased. (OCSE) Only previous and current TANF users have decreased. Child support increases parental involvement among nonresident parents Equal parenting would reduce the number of nonresident parents. Post-judgment modification cases have increased. Child Support Incentives increases the number of child support orders. 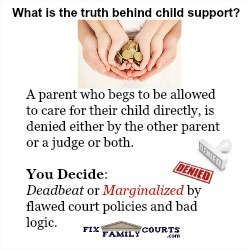 Child Support orders protect children. Child Support Incentives decrease equal parenting time orders. About 40 percent of the kids living in fatherless homes haven’t seen their dads in a year or more. Of the rest, only one in five sleeps even one night a month at the father’s home. And only one in six sees their father once or more per week. Of kids living in single-mom households, 35 percent never see their fathers, and another 24 percent see their fathers less than once a month. (Selzer 1988). Are all of the fathers on child support deadbeats? The number of divorces may have fallen but the number of people raising children in their first marriages has continued to decrease as well. Attorney General Kenneth Paxton, Jr. said Texas served a million families and collected $4 billion dollars last year in child support. (See the blog on this here. )62% of the employees in the AG’s office work in child support. The office has 4200 employees. 2600 of them are child support. How much of the budget in your state is from federal funding? The child support program served 15.6 million children. Why has the number of child support orders increased? In 1999, the federal government issued a list of five performance measure for states. One of these measures used to determine the allocation of incentive funding was to increase the number of child support orders. We don’t see anywhere in the studies or data that say that these orders increased because of deadbeat parents or because the number of needy children increased. HHSclaims that the establishment of child support orders for custodial parents has decreased because the number of people having children outside of marriage has increased to 45% of all children born out of wedlock in 2013, up from 36 percent in 1999. This means that these parents are not forced into the divorcing process where the states have made it routine to establish child support orders in divorces. This explains however why all states have moved to a model of forcing all parents who need an order protecting their parenting time and rights to their children into the same kind of process that divorcing parents face. In Texas they call this a Suit Affecting Parent Child Relationship. “This is what happens when you put the government in charge.” Secretary Tom Price, prior to becoming the Secretary of HHS. Our thoughts exactly. Tom Price might have been talking about the Affordable Healthcare Act as posted in the Washington Post. We hope that we can get him talking about child support issues and the reforms needed here as well. 1. Lippold, K and E. Sorensen. Characteristics of Families Served by the Child Support (IV-D) Program: 2010 Census Survey Results. Washington, DC: Urban Institute, July 2013. 6. HHS – total child support collections of 32.7 billion includes Title IV-D and non Title IV-D.
7. *child support amounts include calculations of how much parenting time is allocated in child custody orders. This conclusion was made based on researching child support calculation statutes in multiple states. This included that some states have moved to income-sharing models. Income-sharing models include parenting time.